It was David Horne who coined the words "the lucky country" way back in the 1970's I think. One only has to pick up a newspaper, or read news on the internet to see that we are well away from the wars and conflicts around the world. Anyone who has travelled, and compared Australia with other countries can see why we often feel we are the luckiest in the world. Weather, scenery, business successes, development, sporting successes and a lot more contribute to this feeling that we are fortunate. One of the things that resonates with me is the wonderful weather and fresh air. Having spent time teaching and travelling in China, the fresh air is always high on my lit of things to appreciate about Australia. We certainly don't have the smog of China. 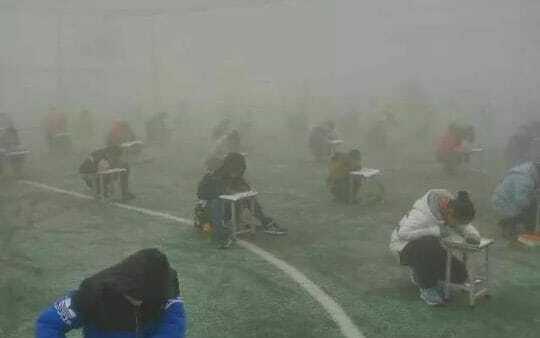 In the last couple of weeks, this article appeared about children sitting exams in smog. It is unbelievable really. Read about it here. I recall in the days that we lived there, we got excited when we would see blue sky. Such was the excitement that we often would text friends with the news. I have been held up at airports waiting for the smog to disappear, and I have driven through foggy streets. All a bit of a worry. When some Chinese friends visited me in February 2016, they ran around with excitement at the sight of all the blue sky. And the gentleman saw stars. He circled with his hands in the air, shouting excitedly. Stars. Stars. He didn't recall seeing any before. We certainly are lucky that we do not have the pollution problem of China and some other countries of the world!!! It is not all doom and gloom in China though they have some current issues. Click here to see photos taken in the last week in China.